When a sevak is initiated into Pushti Marg he is given Diksha by two Mantras; One is the Ashtaakshar Mantra and the other is Brahma Sambandh Mantra (Gadya Mantra). It is the first Diksha in Pushti Marg. Here the Jeev hears the Ashtaakshar Mantra (Shri Krishna Sharnam Mama) thrice from the Acharyavars mouth. This is the first entry point of Pushti Marg. This Diksha can be taken from 41st day of a child being born to anytime during his lifetime. “Nam-Nivedan Samskar” is different then Brahm-Sambandh initiation (Diksha). It is given by a PushtiBhaktiMargiya Guru who recites the Ashtakshar Mantra “Shri Krishnah Sharanam Ma Ma” three times in the recipient’s ears and blesses him with a Tulasi Kanthi. “Nam-Nivedan Samskar” is not an alternative to Brahm-Sambandh initiation. This Diksha has been equated to a person's engagement ceremony i.e. the 'Sagaai' between the Jeev and the Prabhu. The Jeev which has separated from the Supreme Being again remembers his connection to the Lord by hearing this Mantra from any Vallabhkul Balak. Then it is the duty of the Jeev to continuously utter or chant this Mantra so that it gets deeply rooted in his conscience. It is in the interest of the Jeev to continuously keep chanting this Mantra, as a second is sufficient for the worldly vices to lead the Atma astray. It is in the interest of the Bhakts to remember Thakorji and Swaminiji as one entity while chanting this Ashtaakshar Mantra. This Ashtaakshar Mantra summarizes the entire Ved Shastra because it has been uttered by the very Lord himself. By uttering this Mantra one is freed from the anxieties of this world. SHRI : Brings Luck and bestows Wealth. KRI : Burns all the Sins. SHNA : Ill health, fear of punishment by the soul and any sorrow which comes is done away with. SHA : Frees you from the Circle of Birth and Death. RA : Gives knowledge of the Prabhu. NAM : Creates Bhakti for the Lotus Feet of the Lord. MA : Makes one Harbor Love for one's Guru. MA : Unites one with the Lord thereby liberating one from the Cycle of Life or Re-birth. Brahma refers to the Lord Shri Krishna who in the Vedant has been referred to as 'Brahma', in the Vedas as 'Paramaatma' and in Bhagwatji as 'Bhagwan'. Sambandh means to unify completely with the Lord in such a manner that not even time or Karma (one's deed) can ever have the power to destroy it. The Jeev which has been departed from the Lord has forgotten him. Thereby he has fallen in the vicious circle of life and death and is unhappy. The 'Anand Ansh' of the Lord has vanished from his life. To get back this 'Anand Ansh' he has to therefore be re-united with the Lord. And this is possible only by Brahma Sambandh. All mantras always have some norms associated with them. These norms dictate to whom The Mantra can be given and how it can be given. They also dictate when, where, how and how many times a Mantra may be recited by the receiver of The Mantra. The Brahm-Sambandh can ONLY be given by The Guru of PushtiBhaktiMarg, Shrimad Vallabhacharyaji OR on His behalf, by His direct descendents known as “GuruDwar ” – a gateway to Shrimad Vallabhacharyaji. Brahm-Sambandh is given in the morning during Shringar Darshan either in front of GuruDwar’s Thakorji or in front of Thakorji in a PushtiMargiya Haveli (Temple). 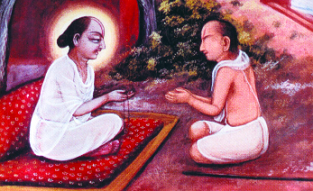 Giving of The Brahm-Sambandh Mantra to a vaishnav means intiating the vaishnav into the PushtiBhaktiMarg. That is the reason the text of The Mantra is not cited here. Very conscientiously decide to receive Brahm-Sambandh. Receiving Brahm-Sambandh means agreeing to live your life as a PushtiVaishnav and so, think it through and do not rush into it. Very thoughtfully decide on one of the many PushtiBhaktiMargiya Acharyas (descendents of Shri MahaPrabhuji) to be your “GuruDwar” . Go to a Vallabhkul Acharya of your choice and obtain the required permission and schedule the day. You should undertake a fast for a day on the day before the designated day. If the Bhakt is a small kid, weak person or person affected by ill health or old, then they can obtain permission for Falaahaar (fruit diet). But fasting is a must before taking the Brahma Sambandh. You continue fasting until you are given the Diksha of Brahma Sambandh by your Gurudev. On the day of Brahma Sambandh, you must wash your hair and be completely oil free. You have to remove any type of thread or any other symbol depicting any other religion from your body. If you are a person who wears the sacred thread (Janoi) then you have to remove the old one and wear a fresh Janoi. First you should wear a Kanthi and then should wear silk clothes or new dhoti/saree. Once you will be dressed, You will be given charnaamrit. Once you take Charnaamrit you must wash his hands and after that you should not in any manner touch his body and for this purpose you should fold your fingers into a tightly closed fist and go to the place where you have to obtain the Brahma Sambandh and sit quietly until called upon. When your Gurudev gives you 'Tulsidal' (small twig of Tulsiji), you should keep it in your palm (upward position) and then utter after your Gurudev every syllable of the mantra clearly and precisely. After the completion of this procedure you have to then transfer the 'Tulsiji' you have been holding in your palm back to your Gurudev's palm. The Gurudev then places this tulsiji at the lotus feet of the Lord on behalf of the devotee thereby completing the process of Brahma Sambandh.